Gotham Cigars Partners with Groupon to Offer 2 Great Deals! 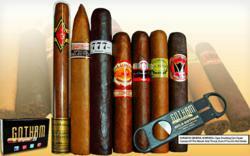 Gotham Cigars launches an unbelievable offer through Groupon. "...they are incredibly marked down to a price that we can’t hold beyond 72 hours” said Gotham Cigars CEO Manny Balani. This offer is the perfect assortment for any cigar lover. The second Groupon offer is five sticks of Gurkha Legend Toro Maduro Cigars and a custom Gotham Cigars lighter with Lifetime Warranty and a can of butane for only $49.99 (retails at $110.00). This makes a fantastic gift for any cigar lover. “Due to the overwhelming success of our last Groupon in December, we are anticipating these 2 offers to be even more successful, as they are incredibly marked down to a price that we can’t hold beyond 72 hours,” said Gotham Cigars CEO Manny Balani. Gotham offers one of the largest collections of high quality cigars, humidors, and premium lighters in the entire US. They showcase and sell almost all the major and high quality brands. At Gotham, cigar lovers can get the freshest products at unbelievable prices. Their selection of premium cigars consists of more than 150 different styles and brands and over 30 different brands of machine-made cigars. Gotham Cigars has been a trusted E-tailer for high quality discounted cigars since 2001, and is always looking for rock bottom prices and great deals to offer their loyal and first time customers.